Adjacent to Haendel’s portrait, Emmanuel Van der Auwera’s Red IV, takes us from pre-election uncertainty to the shock of an unexpected outcome, when the political establishment was defeated by a celebrity populist, whose primary campaign tool was an unfiltered Twitter-feed. 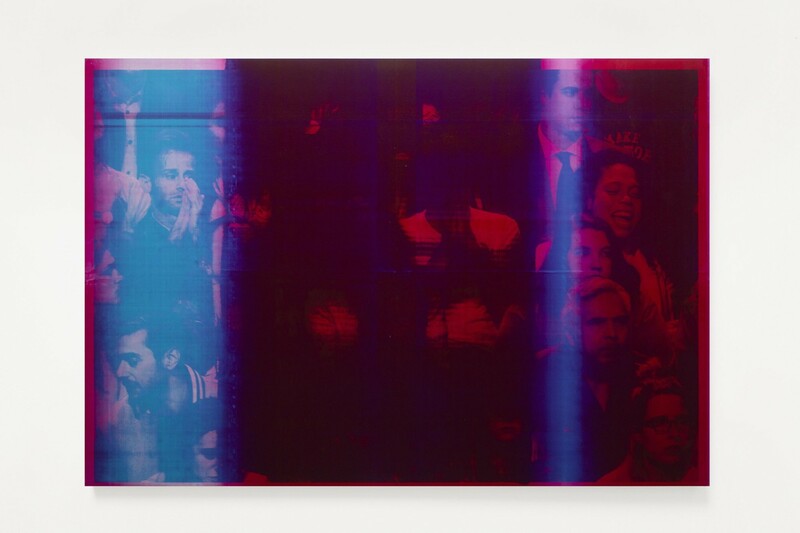 The work belongs to an ongoing series of offset newspaper panels mounted on aluminium, exploring the mediatized representation of the crowd. Newspapers are printed using commercial offset printing, in CMYK colours printed in four stages. Van der Auwera’s monochrome series use only one colour, deconstructing these emotionally charged, mass-media images, asking us to question what economy they participate in, and how their instrumentalisation influences readers. The series hones in on mass reactions to catastrophe or crisis – in Red IV, we witness the moment that Hillary Clinton’s supporters learn of Trump’s victory.